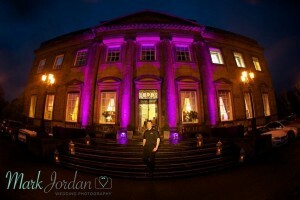 Wedding Venue Lighting allows you to completely transform and change the colour of your venue in an instant, to give you a gorgeous, eye-catching building exterior with our Outdoor Up Lighting. 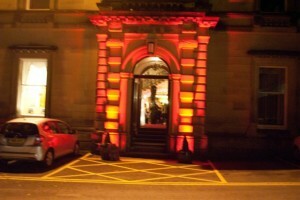 The LED floodlights we stock can illuminate the external walls and entrance of your venue in the colour of your choice. 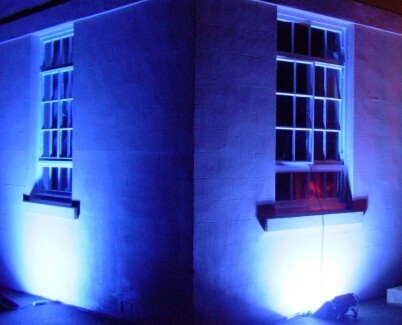 These lights can virtually be used on any type of building or alternatively you can choose to highlight key features and points of the venue, for example, statues, plants, trees, pillars, shrubs and houses. You don’t just have to stick to one colour, we can mix colours and we can also program the lights to change colour throughout the duration of your wedding or event if you so choose. 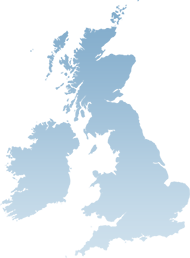 Up lighting is a technique in which lights are placed on the ground and aimed to project light off the wall or at a particular object. 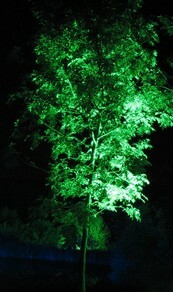 This method of lighting is used to illuminate certain elements and enhances the entire venue’s aesthetic appeal. Lights can also be spread out to create a wash of color. Coloured lighting can be coordinated with the wedding’s overall colour palette and can turn a plain venue into a beautiful, picturesque reception. Changing the color scheme throughout the night can change the atmosphere instantly.